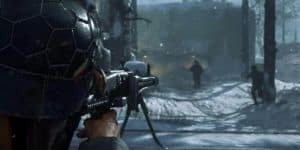 Call of Duty: WWII PS4 Pro Version Details | Nerd Much? It seems that there will be a larger difference than usual between the PS4 and PS4 Pro. In an interview with PlayStation Magazine, Sledgehammer’s co-founder and chief operating officer Michael Condrey stated that Call of Duty: WWII will shine like a new penny on the PS4 Pro. Everything the PS4 Pro provides, including “the new facial system, the new animation system, the new rendering physics system” will be taken to its full advantage. Condrey states that the PS4 Pro will “really bring that fidelity out” in addition to helping the new Headquarters look and feel a lot better. There were not specifics beyond this given, but it seems we can look forward to a larger difference than usual between the PS4 and PS4 Pro. Or at least it sounds that way, it may just be that the game runs smoother, especially in multiplayer. What with Headquarters taking up to 48 players at once and including various complex activities like a firing range, 1v1 pit, a theater to watch Call of Duty eSport matches in, and earning rewards by using the AA guns. The Xbox One X was not mentioned, but that’s probably because this is from the PlayStation Magazine. In addition, it seems as though with the current timed exclusive for the PS4, it is likely that the developers are focusing their efforts on making the PS4 Pro version look better than the Xbox One X. Despite the latter’s clearly superior capabilities. Call of Duty: WWII will be released November 3 on the PS4, Xbox One, and PC. After calling for an entire extra year to build up this game, Activision assured fans that going back to the series’ roots will mean less jetpacks and more fun. Thus far, that does seem to be the case. The betas have come and gone, the verdict being that WWII is certainly on a promising path. We shall see what the full game entails, however.